If you grew up reading the marvelous Anne of Green Gables series chances are you're going to adore this cookbook. Peppered with story quotes, charming illustrations, and beautiful photographs this is a cookbook that would make a lovely gift for a fan. I rarely use but have a wide collection of fandom and pop culture-centric cookbooks so I can't vouch for whether the recipes are actually practical or delicious. My guess is that if the author paid as much close attention to the recipes as she did the little details they're probably great. Whether you pick it up as a gift for a lover of all things Avonlea or for your own shelf it's a beautiful book. 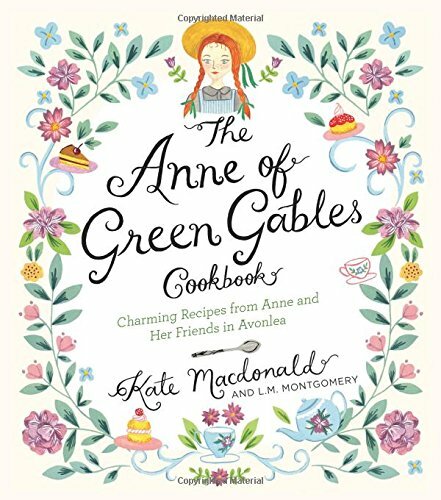 Finally experience the foods from this classic children's series with The Anne of Green Gables Cookbook.Join Anne Shirley and her friends in Avonlea with the charming recipes in The Anne of Green Gables Cookbook, a recipe collection inspired by L.M. Montgomery’s famous children’s book series, Anne of Green Gables.Have you ever wanted to sneak a sip of Diana Barry’s Favorite Raspberry Cordial or try a slice of Anne Shirley’s Liniment Cake (without the liniment!)? Now you can, with the delightful teatime snacks, mains, desserts, and more created by Kate Macdonald, L.M. Montgomery’s granddaughter.From Poetical Egg Salad Sandwiches and Marilla’s Plum Pudding with Caramel Pudding Sauce(without the mouse!) to Gilbert’s Hurry-Up Dinner, the recipes included here are mentioned throughout the books in the Anne of Green Gables series, along with recipes from L.M. Montgomery’s own kitchen. With a lovely grosgrain ribbon, full-color photography, whimsical illustrations, and quotes and anecdotes, this cookbook is the ideal gift for all “kindred spirits” and lovers of Avonlea.